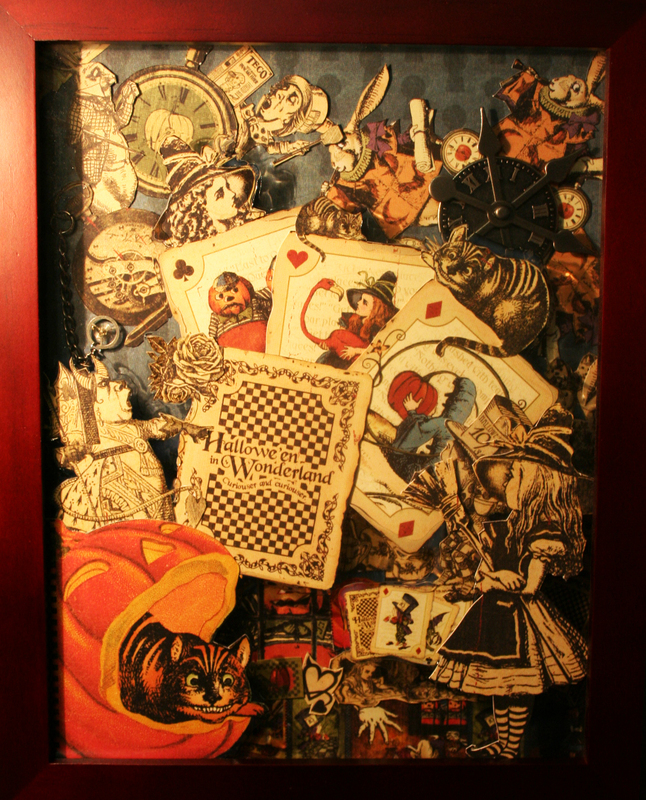 I made this using Graphics 45 Halloween in Wonderland scrapbooking paper and a few bits and pieces of Tim Holtz materials. It is a layered collage. This was a kind of experiment before I try tackling a big steampunk one. I wanted to see how it would look if instead of glossing the entire picture I just glossed the edges of the middle layer to adhear it to the back of the front glass pane. For the steampunk one I plan on working on it has 6 possible layers so I plan on letting it take me a while to make. Also, this frame can be opened up. On the inside behind the cards is a key. I like building things that have pieces that only the owners know about. It gets to be their little secret when others look at what they have. I kind of wanted the center of attraction to be the name on the cards and wanted this to feel a bit like they are tumbling down and surrounding Alice. The Rabbit is up at the top where things are more open so it is kind of like Alice gets to think "Geez, I have to go through all this to get back up there?" With her outside of the glass it is kind of like an introspective moment of "hmmm, how am I going to get through all this and live?" Love it, I wish I could see the 3d layers to this, I'm sure the picture you took doesn't really do it justice. I've thought about using scrap-booking materials recently to add to my collages. I think the possibilities are endless! Any tips? I just got started doing this for fun and as an outlet. Many thanks! It really depends what kind of style you want to go with but for materials I usually buy from Michael's, Hobby Lobby, Archivers (in store and online), and etsy.com. Check around with local small business scrapbooking stores too! My local one is able to let me search through her catalogues and i can pick out what i want to special order through her shop!